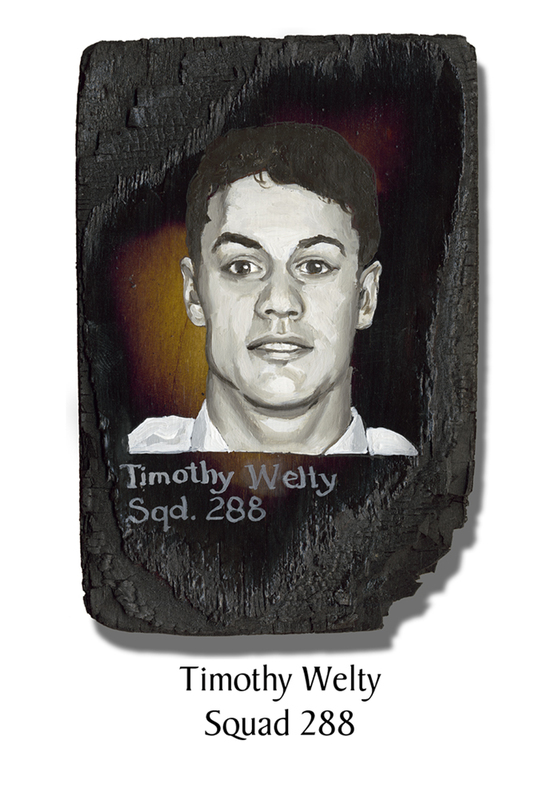 Timothy Welty, 34, joined the FDNY in 1993. Very athletic, Welty was strong enough to do two-finger pull-ups or pushups, or raise a heavy maul off the floor with a straight arm. He enjoyed bungee-jumping, parachuting, mountain climbing, hockey, ski- and motorcycle-racing. Welty traveled internationally to compete as a member of the FDNY’s volleyball team. On the job he was known for his energy and aggressive firefighting. Welty had two children. The youngest, his daughter, was just one-month old. It was not unusual for his four-year-old son to join his father at the firehouse and play in the kitchen while the men ate breakfast. He already had his own pair of hockey skates and practiced with his dad near their home in Yonkers. This entry was posted in Better Angels Stories and tagged 343, 9/11, better angels, Dawn Siebel, FDNY, firefighter, firefighters, firefighters of 9/11, LODD, Manhattan, memorial, NFFF, paintings, portraits, Squad Co. 288, Timothy Welty, World Trade Center, WTC. Bookmark the permalink.